It has been three years since the Bank of International Settlements’ last report on foreign exchange was released. Since then, analysts could only speculate about how the forex market has evolved and changed. The wait is now over, thanks to a huge data release by the world’s Central Bank, which showed that daily trading volume currently averages $4.1 Trillion, a 28% jump since 2007. Trading in London accounted for 44% of the total, with the US – in a distant second – claiming nearly 19%. Japan and Australia accounted for 7% and 5%, respectively, with an assortment of other financial centers splitting the remainder. This data is consistent with a recent survey of fund managers, which indicated a growing preference for investing in currencies: “Thirty-eight per cent of fund managers said they were likely to increase their allocations to foreign exchange, while 37 per cent named equities and 35 per cent commodities. Currency was most popular even though this was the asset class where managers felt risks had risen most over the past 12 months.” In short, the zenith of forex has yet to arrive. There are a few of explanations for this growth. First, there are the inherent draws of trading forex: liquidity, simplicity, and convenience. Second, investors are in the process of diversifying their portfolios away from stocks and bonds, which have underperformed in the last few years (on a comparative historical basis). As investors brace for a long-term bear market in stocks and low yields on bonds for the near future (thanks to low interest rates), they are turning to forex, with its zero-sum nature and the implication of a permanent bull market. Additionally, programmatic trading and risk-based investing strategies are causing correlations in the other financial markets to converge to 1. While there are occasional correlations between certain currencies and other securities/commodities markets, the forex markets tend to trade independently, and hence, represent an excellent vehicle for increasing diversification in one’s portfolio. There is also a more circumstantial explanation for the rapid growth in forex: the credit crisis. In the last two years, volatility in forex markets reached unprecedented levels, with most currencies falling (and then rising) by 20% or more. As a result, many fund managers were quite active in adjusting their portfolios to reduce their exposure to volatile currencies: “The volume growth was really a result of the volatility and the fact that you had real end users actively hedging their exposures.” Another contingent of “event-driven” investors moved to increase their exposure to forex, as the volatility simultaneously increased opportunities to profit. Moreover, these adjustments were not executed once. With a succession of mini-crises in 2009 and 2010 (Dubai debt crisis, EU sovereign debt crisis) and the possibility of even larger crises in the near future, investors have had to monitor and rejigger their portfolios on a sometimes daily basis: “If you have a big piece of news, such as the Greek debt crisis, there’s more incentive to change your position,” summarized one strategist. What are the implications of this explosion? It’s difficult to say since there is a chicken-and-egg interplay between the growth in the forex market and volatility in currencies. [In theory, it should be that greater liquidity should reduce volatility, but if we learned anything from 2008, it is that the opposite can also be the case]. As I wrote last week, I think it means that volatility will probably remain high. Investors will continue to adjust their exposure for hedging purposes, and traders will churn their portfolios in the search for quick profits. It will also make it more difficult for amateur traders to turn profits trading forex. There are now millions of professional eyes and computers, trained on even the most obscure currencies. As if it needed to be said, forex is no longer an alternative asset. What’s the deal with those stress tests? It sounds like the setup for a Jerry Seinfeld joke, and given the way the tests were viewed by the markets, it might as well have been. According to the EU, the tests were a tremendous success. According to investors, the results were irrelevant at best, and patently misleading at worst. The stress tests were first proposed last month as a way to gauge the health of the EU banking sector; it was hoped that the results would demonstrate the soundness of the banking system and mollify investors. Since then, momentum continued to build in the markets, as investors engaged in meta-speculation about the potential impact of the stress tests. In the days leading up to the test, there was a mixture of apprehension and uncertainty. One trader warned: “No one seems to want to hold too much risk heading into the release of the European bank stress tests….A great deal of caution should be exercised…as the results of the stress tests are made public. There is definitely the potential for a huge swing in either direction…as there could be a freight train coming down the tracks.” The Euro traded sideways, capping an impressive 8% rally that began in June. On Monday, the tests were finally conducted: “EU regulators scrutinized 91 of the bloc’s banks to assess whether they have enough capital to withstand a recession and sovereign-debt crisis, with a Tier 1 capital ratio of 6 percent as a floor. Regulators tested portfolios of sovereign five-year bonds, assuming a loss of 23.1 percent on Greek debt, 12.3 percent on Spanish bonds, 14 percent on Portuguese bonds and 4.7 percent on German state debt.” Officially, only 7 banks failed the tests – 5 in Spain, 1 in Germany, 1 in Greece – with a combined capital shortfall of €3.5 Billion. On a related note, the tests were not nearly strict enough: “Analysts were instantly dismissive of the tests, saying the bar was too low. ‘The prospect of an outright sovereign default, which is what has worried markets most, has not even been considered.’ ” Instead of examining the possibility of bonds becoming worthless and irredeemable, the tests only assumed modest losses.” By this standard, argue investors, it’s no wonder that virtually every bank was able to pass. Ultimately, gauging the success of the stress tests will require waiting few weeks. Unlike currency, stock, and bond markets – which can and did offer instant feedback on the news – it will probably take some time before the impact is fully reflected in the money markets. In other words, while an uptick in the Euro, shares of bank stocks, and sovereign bond prices should all be seen as symbols of confidence, the real test is whether investors will be willing to lend directly to banks, at reasonable rates (proxied by 3-month Euro LIBOR, on display below). In fact, that test could come quite soon, as the ECB continues to recall the hundreds of Billions of Euros in loans that it made to commercial banks. If LIBOR rates remain steady and the markets remain liquid, then the stress tests can be called a success. If private investors balk and/or the ECB is forced to extend its lending program, however, the tests will be seen in hindsight as a waste of time. With the onset of the Eurozone sovereign debt crisis this year, volatility levels in forex (as well as in other financial markets), surged to levels not seen since the height of the credit crisis. While volatility has subsided slightly over the last few months, it still remains above its average for the year, and significantly above levels of the last five years. The spike in volatility was easy enough to understand. Basically, the possibility of a default by a member of the EU or even worse, a breakup of the Euro created massive uncertainty in the markets, spurring the flow of capital from regions and assets perceived as risky to those perceived as safe havens. As you can see from the chart below, this trend has begun to reverse itself, but still remains prone to sudden spikes. While the crisis in the EU seems to have (temporarily) settled, investors are attuned to the possibility that it could flare up again at any moment. A failed bond issue, a higher-than-forecast budget deficit, political stalemate, labor strikes – all signal a failure to resolve the crisis, and would surely trigger a renewed upswing in volatility and sell-off in risky assets. The same goes for (unforeseen) crises in other regions, affecting other currencies. Muses one analyst: “Next week? Who knows. One strong candidate is for flight out of the yen as investors start to fear there won’t be enough domestic demand for mountains of Japanese debt and foreign buyers will insist on much higher yields. Another might be that Swiss banking exposure to insolvent east European households causes another banking crisis.” Don’t forget about the UK and US, both of which have hardly put the recession behind them, and whose Trillions in debt represent powder kegs waiting to explode. In addition, there is no way for governments for Central Banks to alleviate these crises due to the “Trillema of International Finance.” Greg Mankiw, Harvard Economics Professors, explains that in prioritizing an independent monetary policy and open capital markets have forced many countries to forgo exchange rate stability: “Any American can easily invest abroad…and foreigners are free to buy stocks and bonds on domestic exchanges. Moreover, the Federal Reserve sets monetary policy to try to maintain full employment and price stability. But a result of this decision is volatility in the value of the dollar in foreign exchange markets.” While the Euro has eliminated exchange rate fluctuations between members of the Eurozone, meanwhile, there is nothing that the ECB can (or desires to) do to minimize volatility between the Euro and outside currencies. From the standpoint of forex strategy, there are a couple of lessons that can be learned. First of all, the carry trade will remain underground until volatility returns to more attractive levels. Until then, the potential gains from earning a positive yield spread will be offset by the possibility of sudden, irascible currency depreciation. Second, growth currencies – despite boasting strong fundamentals – will remain vulnerable to sudden declines. That doesn’t mean that they should be avoided; rather, you should simply be aware that small corrections could easily turn into multi-month weakness. After a slight respite following the culmination of the Eurozone debt crisis, emerging markets financial markets are back to the their former selves, with stocks, bonds, and currencies all performing well. Other analysts see a certain futility in targeting a risk-averse strategy: “It’s not that people suddenly think emerging markets are a lot safer, it’s that they’re realising risk is everywhere and they can’t just assume the developed world is safe.” In other words, some investors are wondering whether it doesn’t make sense to focus less on risk – which has become increasingly random – and more on return. In this aspect, emerging market investments of all kinds are more attractive than their counterparts in the developed world. Across all sectors, money is pouring into emerging markets at an even faster pace than before the credit crisis. This time around, however, analysts argue that it is justified by fundamentals: “Economies in the developing world are slated to grow 6.3% this year and are expected to maintain a similar growth rate through 2013, according to the International Monetary Fund. Advanced economies are seen expanding around 2.4% annually over the same time period.” The Brazilian economy alone expanded at an annualized rate of 9% in 2010 Q1, the fastest rate in 15 years! At this point, the only thing that could derail emerging markets is if investors get too ahead of themselves. According to Citigroup, “Developing-nation shares will rally 20 percent to 25 percent by the end of this year as the world economy avoids a double-dip recession and attractive valuations lure investors.” That would bring share prices past the current level and dangerously close to the pre-credit crisis highs of 2008. The JP Morgan Emerging Market Bond Index (EMBI+) has already shattered its previous record, and given the current spread of only 300 basis points to US Treasuries (which themselves are trading near all-time lows), one has to wonder if investors aren’t at risk of re-entering bubble territory. If for whatever reason investors get spooked, it could spark the same capital flight that followed the bankruptcy of Lehman Brothers, in which emerging market and commodity currencies alike fell 30-50% over a duration of mere months. While no one is predicting a similar outcome this time around, I think prudence and caution are nonetheless advisable. Today marks the one-month anniversary of China’s decision to remove the Yuan’s peg to the Dollar, and allow it to float. Now that the news has had a chance to wend its way through the financial markets, I think it’s time both to reflect and to forecast. Over the last month, the Chinese RMB has appreciated by slightly less than 1% against the Dollar, although most of that jump took place in the day that followed the June 19 announcement. After the initial excitement faded, a sense of disappointment set in as it became clear that China had no intention of allowing the RMB to appreciate rapidly: “The subsequent appreciation of the yuan against the dollar is likely to be small, perhaps just a few percent over the remainder of the year.” In fact, futures prices reflect only an additional 1.5% appreciation over the next 12 months. Due both to its slow speed and small scope, the revaluation could conceivably benefit the Chinese economy. That’s because in the short-term, a more expensive currency will mean higher prices paid for exports. The quantity of exports is unlikely to decline, such that total export revenues could actually increase. According to one analyst, “With Chinese imports, there are no substitutes in the short term. Maybe in 10 years, importers will have a choice, but right now they will just have to pay more. No other country…can build a manufacturing base and all the infrastructure that you need — transportation, energy, the entire value chain to the final good — takes many years.” As if on cue, China’s trade surplus expanded in June, in spite of the revaluation of the Yuan. As a result, American manufacturers and other vested interests have announced that they will continue to lobbythe US government to pressure China on the currency issue, on the basis that the undervalued RMB is eroding both the US economy and the labor market. Argued the director of the Peterson Institute for International Economics, “The case for a substantial increase in the value of the renminbi is thus clear and overwhelming. An appreciation of 25% to 40% is needed to cut China’s global [account] surplus even to 3% to 4% of its GDP. This realignment would produce a reduction of $100 billion to $150 billion in the annual U.S. current account deficit.” It might also help to restore the estimated 1.4 million jobsthat have been lost due to China’s forex policy. According to analysts, however, political infighting make it unlikely that any new law or punitive tariffs will be imposed anytime soon. At the very least, China will continue to make the Yuan more flexible, so that one day it can float freely. It has already moved to facilitate trade settlement in Yuan, and analysts expect ” ‘more than half of China’s total trade flows, primarily bilateral trade with emerging markets, to be settled in renminbi in the next three to five years.’ ” China is also making it more attractive for foreign investors to hold Yuan, by loosening controls that govern Chinese capital markets and creating new investment vehicles that will cater directly to foreigners. In the mean time, holding RMB is pretty unattractive given both “the hassle of getting money in and out of China” and the low rates offered by Chinese money market funds. Euro Rally: Temporary or Permanent? Since the beginning of June, the Euro has rallied by an impressive 8% against the US Dollar, and by comparable margins against other currencies. The question on every one’s minds, of course, is whether this represents a temporary pullback or a permanent correction. Due to its sudden rise, the Euro became a much less attractive funding currency for carry traders. It helps that other Central Banks are delaying interest rate hikes, which means it’s difficult to turn a solid profit (on a risk-adjusted basis) from shorting the Euro. In addition, the markets have started to turn their attention to economic fundamentals in the US, which had been edging out the Euro in one of the perennially important rivalries in currency markets. In short, it suddenly became obvious to traders that the economic and fiscal conditions in the US are at best equal to those in the EU. Finally, there was an implicit acknowledgement among the EU leadership that the so-called sovereign debt crisis is actually in many ways a banking crisis. This admission came in the form of stress-tests on 91 of the EU’s largest banks, designed to determine their exposure to sovereign debt and placate investors. After all, “It was German and French banks that led the way in lending to Greece or Spain.” This misjudgement has spurred such banks to set aside Billions in potential losses and vastly curtail their lending activities. Unfortunately, investors are skeptical that the stress tests will be stringent enough, seeing them as a mere publicity stunt: “While the EU have tried to counter these suspicions by promising to publish the result of stress tests, the market is fearful that stress tests will force some banks into writing down losses on non-performing loans.” By extension, investors are still equally concerned about the possibility of a sovereign debt default, even one that it is only partial. In other words, the consensus is that despite the EU’s best efforts to tackle the crisis, it still has yet to enact meaningful structural reforms, opting instead for short-term stopgap solutions. According to The Economist, “The debate about how to save Europe’s single currency from disintegration is stuck…because the euro zone’s dominant powers, France and Germany, agree on the need for greater harmonisation within the euro zone, but disagree about what to harmonise.” There remains a lack of agreement over whether the economically and fiscally weaker members of the EU will be allowed to remain members, and if so, what if anything will be done to keep them in line. As you can see from the chart above, time is quickly running out. For the majority of EU countries, debt is now rising faster than GDP. From the standpoint of many investors, default seems like the most likely outcome since such countries lack the political muster to reduce their budget deficits, nor can they devalue their debt through currency depreciation, due to the common currency. As to what’s propelling the Yen higher, there is very little mystery. Two words: Safe Haven. “The yen’s attractions lie in its status as a haven from the turmoil that has engulfed financial markets as, first, the eurozone debt crisis unfolded and, then, fears about a double-dip recession have intensified.” To be sure, there are a handful of currencies that are arguably more secure and less risky than the Yen. The problem is that with the exception of the Dollar, none of them can compete with the Yen on the basis of liquidity. In addition, thanks to non-existent inflation in Japan and low interest rates in other countries, there is very little opportunity cost in simply holding Yen and simply taking a wait-and-see approach. According to some analysts, interest rate differentials will probably remain narrow for the foreseeable future: “Global bond yields will fall, reducing the incentive of yen-based investors to place funds abroad.” In fact, thanks to low interest rate differentials, the Yen is not even the target funding currency for carry traders. Suffice it to say that investors are not bothered by the fact that Japanese monetary policy is extraordinarily accommodative and that Japanese long-term interest rates are the lowest in the world. For those who are concerned about rising interest rate differentials, consider that this probably won’t become a factor until the medium-term. A greater concern, perhaps, is Japan’s massive debt. Near $10 Trillion, public debt is already 180% of GDP, and is projected to grow to 200% over the next few years. Total public and private debt, meanwhile, is by far the highest in the world, at 380% of GDP. The Japanese government is planning to implement “austerity measures,” but political stalemate and election pressures will make this difficult to achieve. All three of the rating agencies have issued stern warnings, and downgrades could soon follow. Here, Yen bulls retort that as unsustainable as this debt might appear, the majority (90%) of it is financed domestically, through the massive pool of savings. The remaining 10% is eagerly soaked up by foreign investors, who view the debt as a more attractive alternative to cash and stocks. [This is the great irony that I alluded to in the title of this post – that more debt is viewed positively as “liquidity” and does nothing to hurt the Yen]. At this point, the Yen can only be toppled by Central Banks: either foreign Central Banks will hike interest rates and make the Yen unattractive in contrast, or the Bank of Japan will intervene directly to prevent it from rising further. Recently, it struck me: the US does not care about the Dollar. If you look at fiscal and monetary policy, there is actually a remarkable degree of consistency. Both reflect a clear disregard for the conditions that are necessary for a strong currency. This might seem ridiculous, given the Dollar’s amazing performance of late. It has appreciated healthily against almost all of the world’s major currencies, and is also more valuable on a trade-weighted basis. 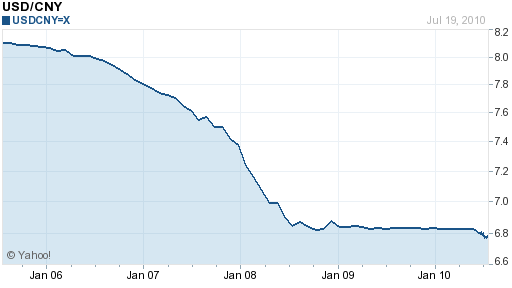 Bear in mind, however, that this rise is entirely a function of the (perceived) crisis in Europe. It speaks not to any strength in the Dollar, but rather to weakness in other currencies. In fact, as I wrote earlier this week (“US Dollar Paradigm Shift“), as investors have returned their gaze to the fundamentals, the Dollar has suffered. Without drilling into the nuts and bolts of US fiscal policy, consider that the US budget deficit will exceed an unthinkable $1 Trillion for a second year in a row. The national debt is now growing much faster than GDP, and servicing it is consuming an ever-increasing share of the budget. With concerns looming of a double-dip recession, meanwhile, tax revenues will probably stagnate, even regardless of what happens to spending. In short, US budget deficits are going to continue to be a fact of life for the immediate future. Monetary Policy is equally disastrous. The Fed is pre-occupied with keeping interest rates low and with promoting an economic recovery. $2 Trillion of newly-minted money is still flowing through the system, and it’s unclear when it will be siphoned out. There are a few inflation hawks on the Fed’s Board of Governors, but they lack the power to effect a short-term change in monetary policy. In short, there is a clear consensus that perennial budget deficits and low rates are wrongheaded at best, and disastrous at worst. From the standpoint of currency markets, what matters in the short-term are interest rates, and what matters in the long-term is inflation. The Dollar is in an unfavorable position on both fronts. Interest rates are currently near 0% – the lowest in the world – and easy monetary policy and high government debt increase the likelihood of inflation in the wrong-term. In light of this notion, the only logical conclusion is that the Dollar simply plays no role in the formulation of government and Central Bank decision-making. Since the inception of the credit crisis, this was a luxury that could be afforded, as safe-haven capital poured into the US. If/when the crisis abates, this capital will probably depart, as investors are forced to consider the fundamentals. It’s understandable that forex investors basically ignore New Zealand. Its economy is around 10% the size of its neighbor Australia, its currency is less liquid, and spreads are higher. 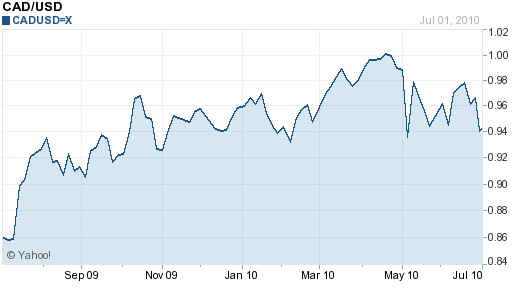 Given that its performance closely tracks the Australian Dollar, meanwhile, why pay it any attention? To be sure, the new currencies from Down Under trade in virtual lockstep, having strayed by only a few cents in either direction from their trading mean over the last year. Since the beginning of May, however, the Kiwi has staged an impressive rally, rising 8% against the Aussie in a matter of weeks. Perhaps, there is something worth analyzing after all! According to most analysts, the sudden rise is largely a product of risk-appetite. Specifically, as the EU sovereign debt crisis stalls, investors are relaxing, and gradually moving capital back into growth currencies, like the New Zealand Dollar. 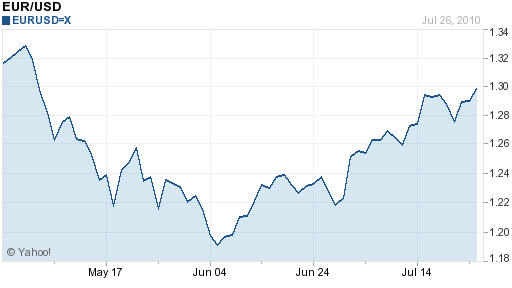 In fact, the Kiwi recently rose to a one-month high on the same day that Spain successfully completed a bond auction. For proof of this phenomenon, one need look no further than the close relationship between the NZD/USD rate and US stocks, as proxied by the S&P 500. You can see from the chart below that they have largely tracked each other over the last 12 months. This relationship seems to have intensified over the last few weeks, as the New Zealand Dollar sometimes takes its cues directly from releases of US economic data. However, New Zealand economic fundamentals are also playing a role, perhaps even the dominant role. 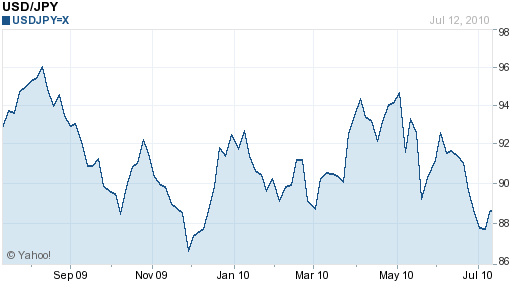 According to one analyst, “The NZ dollar had now recovered nearly all its losses of late May…Domestic fundamentals had contributed relatively more to the NZ dollar’s recent recovery than had the mild improvement in the global backdrop.” Unlike Australia, which has been racked by political disruptions and concerns over an economic slowdown by its largest trade partner (China), New Zealand continues to coast at a healthy pace. Moody’s forecasts that New Zealand’s economy will expand by 2.4% in 2010, and “assuming a healthy global economy, New Zealand’s recovery should evolve into a self-sustaining expansion during 2011 and 2012.” This should set the stage for near-term rate hikes, beginning with an expected 25 basis point hike on July 29. Analysts project that the benchmark rate will reach 3.75% by the end of 2010, and 5% in 2011. Widening interest rate differentials, combined with the ongoing recovery in risk appetite, could turn the Kiwi into a popular carry trade currency. Given that the Central Bank of Australia is also projected to further hike rates, it seems the Aussie will join the Kiwi in its upward march, and that the two currencies will continue to trade in lockstep. Options traders might try to construct a low volatility strategy, such as a short straddle or selling covered calls against the pair. For currency traders that prefer the Aussie, meanwhile, the New Zealand Dollar could serve as an attractive hedge. Since the inception of the financial crisis, the Dollar has been treated as a safe haven currency. Simply, when there was a surge in the level of risk-aversion, the Dollar rose proportionally. When risk aversion gave way to risk appetite, the Dollar fell. It was as simple as that. Lately, this notion has manifested itself in the EUR/USD exchange rate, with the Euro embodying risk, and the Dollar embodying safety. In fact, a carry trading strategy has unfolded along these lines and made this phenomenon self-fulfilling: traders have taken to reflexively selling the Dollar when news is good and selling the Euro when news is bad. From my point of view, it is not the possibility of a prolonged recession that is itself noteworthy (though this is surely cause for concern), but rather that the currency markets are paying attention it. To be sure, news of the EU sovereign debt crisis continues to dominate headlines and influence investor psychology. Barring any unforeseen developments, however, this crisis probably won’t evolve much further in the short-term, and it’s logical that investors should turn their attention back to the data. As a result, “The popular risk-related trade on the euro ‘that was prevalent in the first half of this year appears to have derailed for the time being as market players increasingly focus on comparative fundamentals once again,” summarized one trader. In fact, the Dollar has fallen by 5% over the last month, both against the Euro and on a trade-weighted basis. Over the long-term, analysts are divided over which narrative will determine the EUR/USD rate. It would seem that until there is some resolution to the sovereign debt crisis (whether positive or negative), an air of uncertainty will continue to hang over the Euro such that it remains an apt funding currency for a carry trade strategy. US capital markets are the world’s deepest, most liquid, and most stable, and in times of crisis will probably continue to attract risk-averse capital. On the other side are those who argue that the US will shed its safe-haven status and become a growth currency. According to this line of thinking, the US economy will outperform the EU, Japan, and Britain – its peers/competitors in the Top Tier of currencies. “The euro zone has been stricken by crisis over the debts of its weaker members. Japan will only emerge slowly from deflation and the U.K. has to deal with its record high budget deficit over the next few years,” argued one analyst. 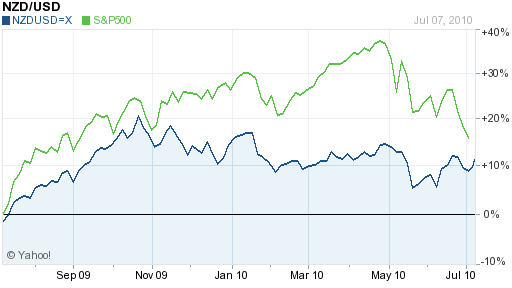 As a result, “The dollar will return to a pattern seen in the early 1980s and late 1990s, when it appreciated as stocks rose…The likelihood that the dollar performs strongly rather than weakly when investors are risk-seeking will signify a major change in the currency markets.” Under this paradigm, the Japanese Yen and the Swiss Franc would probably become even further entrenched as safe-haven currencies. Finally, it’s worth pointing out that such a paradigm shift wouldn’t necessarily be good for the Dollar. If the US is indeed able to put the recession behind it, then a renewed focus on growth fundamentals would send the Dollar higher. If the Double-Dip materializes, however, Dollar bulls will probably find themselves hoping that the Dollar can retain its safe haven status. 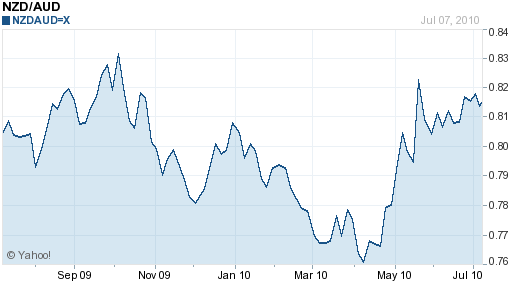 On a trade-weighted basis, the Canadian Dollar (aka Loonie) has appreciated nearly 10% in 2010. 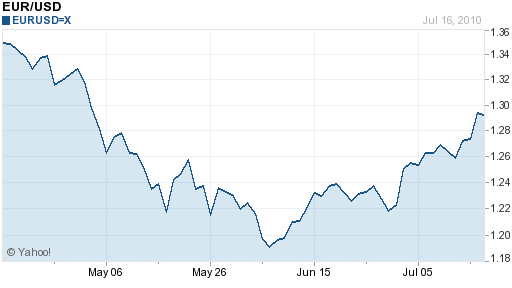 At the same time, it has fallen 8% against the Dollar since the beginning of May. This contradiction is reflected in an explosion in volatility: “CAD has been very volatile – the average intraday spread between the high and low in CAD over the last 21-years has been 83 points; over the last month it has been 182 points.” How can we make sense of this uncertainty, and which trend is ultimately more representative? On the one hand, the Loonie continues to be thought of as a commodity currency whose rise and fall is closely linked to fluctuations in the prices of certain raw materials. “It’s not just about oil any more, but also natural gas – whose price has carved out a bottom – and precious metals, which command a 13-per-cent share of the TSX’s market cap versus less than 1 per cent for the S&P 500,” observed one analyst. From this standpoint, it’s perhaps not surprising that a 7.2% drop in the Raw Materials Index was matched by a proportional drop in the value of the Loonie. On the other hand, the Loonie is being punished by the Eurozone debt crisis and the consequent flight to safe haven currencies: “The Canadian dollar is following the risk aversion tones of the market.” While the Loonie might have otherwise been “been closer to parity” then, it’s understandable that the so-called “panic trade” is holding it down. For now, interest rate hikes are largely beside the point as investors remain firmly focused on the EU fiscal crisis: “People are taking risk off heading into the summer, to reassess,” summarized one trader. A resolution of the crisis, would surely send the Loonie back towards parity. In the interim, Canada’s strong fundamentals will ensure that it won’t fall much further, poised to strike when the time comes.